Today I have the honor of a guest post at Leave it to Livia. Now, if you’ve not met this enthusiastic fireball, get ready! Livia will knock your socks off. She asked me to share my beginnings, so brace yourself and jump on over to her site. See their site for details and to join the group! The third book in the Desolation series by Ali Cross is now available – Destined. You should see the amazing stuff she is giving away as well. But wait, but you will, because the awesome Ninja Ali will be my guest on Monday! Purchase Angela Felsted’s Chaste by December 15 and not only will all proceeds go to help victims of Hurricane Sandy, she’ll match them dollar for dollar. Full details at Jessica Bell’s site or at Lydia Kang’s site. The voting is close in Karen’s Annual Blog Awards contest. If you haven’t voted for Blog of the Year, hop on over!! Authors, need a book trailer? Brinda Berry is hosting a giveaway for one. See her site for details. The Marquis by Christine Rains is now available!! This is the first book in The 13th Floor series. Congratulations, Christine. Shelly F. Batt at Voice of a Writer is offering to critique the first twenty-five pages of one – two manuscripts – if you’re looking for a little help, see her site for details. January 2, 2013 is the next posting date for the Insecure Writer’s Support Group and the co-hosts will be Jamie from Mithril Wisdom and Tyrean. Hosted by two awesome ladies, M Pax and Tyrean! If you could choose between a scrumptious second breakfast and a perilous unexpected journey – which would you prefer? Second breakfast - I am so not the adventurous type. What is your Favorite part or quote from the book that you hope will be in the movie? The full exchange with Gollum – the riddles were cool. Is that not awesome? I’m immortalized forever in plywood. And she’s sending him to me! Thank you SO much, Elise. Whoa!! Ellie, it’s amazing. Thank you so much for putting it together. You are a special friend. And one had Kate! Dude, you are the man. Bonus prize is your choice – photo of me OR the guitar recording OR (since you live too far away for us to meet for a beer) a phone call from the Ninja. TS at The Non-Review “What Cats are Saying About Alex…” HILARIOUS! Dude, thanks for bringing Melvin back for me. Hart at Confession of a Watery Tart She wrote me a song to the tune of “Walk the Way” that is PERFECT! Heather at The Waiting is the Hardest Part She had Stormy the Weather Gnome do the post – do I need to add anything? Stormy rocks! Tara Tyler Look at the cool drawing she did for me! And before this post gets any longer, special thanks to Chuck, Cassie Mae, Julie Kemp, Kimberly, DL Hammons, Angela Brown, Robyn Campbell, SpacerGuy, Mina Burrows, ”T” Tanya, Livia, and everyone else for the heartfelt and/or hilarious words. And a big thanks to the awesome hosts, Mark, Morgan, Stephen, and David. If you missed this event, you missed something really special. Everyone was saying this was different. It wasn’t about me – it was about this awesome community. You guys understand the importance of supporting one another and it really showed. Don’t forget to visit Leave it to Livia! Congrats to Elise and Ellie and ...SUh-weet... I think like a Ninja Captain on a Thursday afternoon. PS... Hey now, Lee is worthy of a roast. But it is very kind of you to think of he who will dance the Bald Guy Hula - one day. There were so many wonderful entries - creative, heartfelt. Ellie's video really rocked! And I think the Cheers Blogfest is a great idea, both your choices for next year are top notch! Oh, and Thank you Alex for a copy of CassaStar!! I'm so excited about getting my very own signed copy!!! Mark, great minds think alike! And you are worthy. Elise, congratulations! And I can't wait to get my little Ninja guy. Congrats to all the winners of Alex-fest! It was great fun! Congrats to the winners of the blogfest. They were exceptionally good. I think Arlee Bird should be the next to have a blogfest, as you know I met him and he is one of the nicest people I have met. He put himself out for myself and brother that day in LA. As he appears on blogland is exactly how he is in real life. Have a rest this week-end Alex, I think you deserve it, I do miss my music as Hypster is still not working. Wow - there's some good stuff going on around blogland! I loved reading all the Alex posts, even though I didn't take part myself. The winners you mentioned were great! I love the little ninja guy. I was thrilled to be a part of something so cool that celebrated someone so deserving. Happy Friday. I enjoyed reading everyone's entries. What a hard choice but you picked some great talents!! Congrats to the winners. And to the ones that gets a picture... You have more willpower than I do at keeping it a secret. It's like your own special "my precious". I'd love a Hobbit to teach me how to relax! Congrats to the winners. Wish we could all win and choose to have you post your picture. I'm excited for the Hobbit. I may try to see it on Monday, my last chance before my trip to China. Congratulations to the Winners. The entries were awesome! I'm looking forward to seeing The Hobbit over Christmas with the Kids. Elise's little plywood-ninja-captain is too cute! And Ellie's video is awesome! There were soooo many great entries! Congratulations to Elise and Jeremy. That Ninja is cool! I won?! Whoop. Whoop. I get a picture and recording, although just knowing you liked it was prize enough for me. It really was my first video attempt. It is amazing what you can do with Windows Movie Maker. All you need is text, royalty free images and music, and A LOT of patience. I did swear a few times! So glad you liked the blogfest. I love the cardboard ninja. How cool is that?! And glad you liked the Hobbit... I'm holding out for another week. LOL at your answer to what you left behind on a trip!! I love the little Ninja! And Ellie's video is great! I like the choice of Carl Sagan as Alex. Congratulations Ellie, Elise and Jeremy! It was a lot of fun. Looking forward to roast someone else next year! I went around to as many as I could and can't believe I missed a couple of those...they were killer! Congrats to the winners. Those two I did manage to see and they were first class. Elise even used powertools! Ha!! I'm not surprised at the winners. Fantastic tributes!! Congrats to the winners of the blogfest. Elise I loved the video. Will head over to Livia. Indie life by the Indelibles sounds like something I'll definitely watch out for. Congrats to Ali Cross on publishing her third book in the Desolation series. Amazing charity work, Angela Felsted. Brinda, I must hop over to your site. Much success to Christine Rains. Shelly F. Batt, many authors will appreciate your help. Thinking about joining the Insecure Writer’s Support Group. Cathy, you are no schmuck! Still one of my favorite blogger buddies. Yvonne, sorry about Hypster. And that's why I mentioned Lee - he's be perfect. Kimberly, your post was really, really special. Natalie, you're going to China? Wow! Ellie, your entry was amazing. You could do book trailers. And be watching your email today. Julie, just hope no one takes my answer wrong, it was just the first thing that came to mind. ML, that's right - a woman with a drill! Congrats to the winners! There were some awesome posts. And thank you for the shout-out, Alex. Have a great weekend! Elise's cut out was so great-- there were a lot of really creative tributes from banners to videos. Great community! Indelibles is such a great idea for the indie authors. Fantastic way to find support. I'm just wondering how you keep up so well with everybody's stuff. Congrads to Elise and Ellie and to everyone who participated! That was so much FUN!!! Ellie's video was ALL THAT and more. That Alex dude is perfect. Excellent Elise! Plus the drawing. You scored big, my friend. The best achievement you received was to see how many peeps LOVE you to pieces. And it's because you are who you are: Supporter Ninja! :-) Thanks for all you do Alex! I'm thankful for Alexfest. It showed me just how many bodacious peeps live in bloggerland. Happy weekend Alex to you and Mrs. C.
Hi Alex - it was a great fun fest .. and I'm so pleased two of my three came up - I had a writing one - Roland ... but Elise's mini Alex' were excellent, while Ellie's video is superb .. It was fantastic .. but as you say all about community - which is what is so great about being here and a part of it..
All very deserving winners. And well done to the blog hosts. Wish I could have got to more posts in the bloghop, but sadly on limited time and a borrowed laptop! Hope you're not too scorched from your roasting... it seems there were some very creative entries. Elise's ninja is great! Robyn, thank you. It was overwhelming. And yours was really special. Hilary, it was about the community. And I'm seeing the movie this afternoon, so my review will appear on Monday. Wow, that blogfest led to some amazing stuff! Great video. Congrats to the winners. And, wow, there are a ton of great book releases this month. Carl Sagan is demi-god for me. Watching his shows made me feel good, at peace, in awe, curious, intrigued, exhilarated and filled my eyes with the magic of the universe. I've read many of the posts in this blogfest and I think indeed this was the best choice. Well, nice to meet you, Alex. Funny, I'm tired...so I looked at the number of comments and thought, "That Alex, over 100 already and he recently posted!?" Then I left this comment on the post below (I've cut and pasted it under the correct post. Time for more coffee! ): Wow, congratulations to the winners. Their contributions are amazing and well deserved. Take pride in your greatness, and I'll be visiting Livia. I've seen quite a few Alexfest posts and they've all been great. Well-deserved winners. I need to visit some of the others. The entries were amazing. You're right this was all about the community. Lee would make an excellent choice for next year. Stunningly awesome entries there. I love the plywood ninja captain. And I laughed so hard at the virgin comment I think I almost broke something. So funny. Congrats to all of the winners. 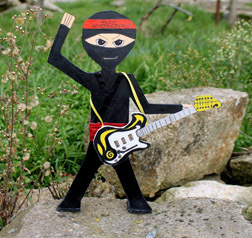 Loving the little wooden Ninja- so cool. Can't wait to see The Hobbit this weekend! Super excited. And, I'm all about elevensies- not so big on the adventure. I prefer the comforts of home! Hah!!! I LOVE that little ninja! Also how great is the cover to Ali's book? So many great things going on. I'll be seeing the Hobbit this weekend. Yay! The blogfest was great! So many awesome posts. I'm sorry I missed the blogfest. My blogging has been a little erratic to say the least recently. It sounds like a ball was had by all concerned. I loved Ellies video! There really are some amazing bloggers in this community. Lots of great news! Congrats to the winners of the Cheers Alex Blogfest! I read so many great postings! Great posting. Heading over to read the guest post! I go away for a couple of weeks and everyone holds a blogfest- sheesh! LOL Looks like I missed a lot of happenings. Well better luck next time huh. Great post Alex- you always manage to fit so much and keep it simple and readable. I'm dying over your hobbit answers, because for some reason, I didn't expect the Ninja Captain to admit when he lost his virginity. I can't even type that without laughing and blushing a little. And I rocked that trivia! Whoot whoot! i am spinning... i read my name, read it again... i am one happy guy, thank you... you spun a long hobbit-like adventure in this post... meaning it was all worth the trip in the end. i think that makes some sense, in my head it was suppose to compliment. it's going to be a grand day indeed! There's so much exciting things happening, it's hard to contain the excitement! Congrats to the winners. All were worthy entries! Those trivia answers were really bloody hard but then maybe it's because I'm a bah humbug sort of guy! Al, I'm really happy Ellie won. She set the bar high as she was one of the first to post. Robyn, that made my morning! Thanks for the laugh. Rusty, glad I could amuse you! Sarah, Monday's post will rock because of Ali! Cassie, yours was one of the best. And glad I could amuse you on a Friday morning! Jeremy, your entry was one of the best and deserved a win! Ninja-guitar Wonderful composition, beautiful and fun. Greetings. I'm loving Elise's guitar man!! That's awesome. I'm excited to see The Hobbit. Probably won't be 'til Christmas, though. Damn, if you had any more information on here you'd have to have your own news channel! You are well loved, my friend. I hope you absorb some of it and let it carry you on those 'insecure' days that we all have. I agree about 'second breakfast'. Who needs adventure? When you get the plywood Ninja you should do a post about him! Thanks so much for the honorable mention! Appreciate it. Indie Life sounds like something worth joining! CONGRATS to all the wonderful winners. And that plywood ninja is just incredible. Wow. Hoping to see the Hobbit this weekend. I think it's going to be awesome. second breakfasts are nice. I would rather go running in the rain and eat it on the way - food is good no matter where one is, usually. Congratulations to the winners! Some of them got real creative! Elise is the bomb! Loved that post. That video was really well done too. Thanks for the mention too, Alex. That's probably the best time I had participating in a blogfest. Congratulations to the winners! I loved Elise's little ninja dude. She is certainly a worthy winner! BTW, thanks for adding those pictures on the A-Z guest post! That was nice of you! Some awesomely creative work for the blogfest. Well-Deserved. Congrats to the Alexfest winners. Aha, so it's true what they say about band camp, eh? It's amazing the way you know about absolutely everything in blogland. Congrats to the top notch posts for your big day. Now that's a fandom! Elise is a great choice. Big congrats to Christine! Love the cover. Favorite Hobbit Trait: I have hobbit feet. Adventure or meal? Can't I have both? Left behind...I left my favorite sweatshirt at DisneyWorld when I was 7. Guess what? I didn't even notice until several weeks later when I came down from the Disney high. Favorite Part? I'll have to agree with the Gollum exchange. Thank you, Heather. Your post was one of the best. I'll have to post a photo of the Ninja dude in front of my guitar. Morgan, a Madman blogfest! Sign me up now. Mina, your post was really awesome. Sherry, I hope that was all right! I forget to ask. Jess, happy to sign up! Mary, it was a heck of a band trip. Nicki, I try to stay on top of everything. Congrats to all the Alexfest winners! That was an awesome Alex that Eise made. It's so cool she's sending it to you. Hobbits do like their comfort - so do I, but I like a bit of adventure, too. And I can't wait to see the riddle part in the movie. Congrats to everyone on their new releases, too! Congratulations to the winners. What a creative bunch. It was a lot of fun and I sure enjoyed the entries. Let's do this again, Alex. And thanks for the links! Mark and Arlee are perfect victims for another Cheers Fest!!! So many good books! Congrats to Ali, Angela, Christine, Ellie, and Elise! And thank you for joining Hobbit Fest! Loved your answers, especially numbers 2 and 4 . . .I think all the riddles were in the movie, although I wanted to hunt down my copy of the book and check last night/this morning at 3a.m., I fell into bed and dreamt dreams of sword fighting Hobbits instead. Midnight movies are fun with enthusiastic Hobbit fans, but I'm not used to staying up late. Thanks for the shout out, it was a lot of fun. Donner is Rudolph's father? I did not remember that at all. Been a long time since I watched the Rudolph Christmas cartoons. Capn Ninja has A DARK SIDE!! LOL!!! It's good to be a heathen now and again..! LOL! Congrats! to the winners! Gotta love the cardboard ninja Elise made. I'd ask her to mail it to you. It's that cool! Tara is great with her artwork too! and be sure to tell us about the hobbit, i know you will see it before me! Must have been impossible to pick the winners. I enjoyed so many of the entries. Both Mark & Lee would be excellent choices for next year! It was a fun event. Thanks for all the useful information. And I loved what everyone came up with for the blogfest- what fun! I already was over at Livi's site- great guest post. Cheers! Brilliant! I missed a couple of the prize-winners so I'll check them out now. But I did see Elise's post which really did deserve a prize. From what I've heard, Gollum makes The Hobbit movie. The riddles scene is everyone's favourite. I tried twice to read The Hobbit many years ago, at my family's insistence, but never got further than the end of the second chapter. Though I'll probably be interested in seeing the movie. I couldn't see Elise's image or Ellie's video here so I'll go to their sites and see it they show up. The ____BlogFest was a grand party. I don't know if I could handle the roast considering the shoddy way I've been doing blog visitation of late. I'd have to borrow some of your clones. Or maybe you can tell me how to make my own clones. Congrats to the winners! It was magnificent sport, and I wish I had the time to read all of them. Until next time. What a great post. Thanks for mentioning the Indelibles. And Oh. My. Goodness! 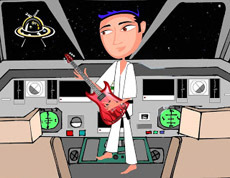 I absolutely love that plywood Alex playing the guitar in a ninja suit. It's awesome!!! I signed up for Indie Life. I have my tickets for The Hobbit in my wallet. "Christmas on the Corner" will be free one more time on Monday, as will part 11 of Spinner. Joylene, we'll do it again and roast someone else! Tyrean, that's cool that you've already seen the movie and good to know the riddles are intact. TS, your entry was awesome! Kitty, glad I could amuse you. Tara, that would be awesome!! Julie, your post was really sweet. Diane, if only it had been just five minutes! Congratulations to the winners! You all deserve the recognition! That blogfest was a blast! I just came back from Livia's and wow! What a great, inspiring interview. I want to grow up (disregard the fact that I'm *ahem 43*) to be just like you! Time to buckle down, me thinks! Thank you for the valuable information you provide. Congrats to all the winners! There were many funny posts but somehow you were always the hero. A nice way to slide into the end of the year. Excellent choices -- Wow, what beautiful work all the way around. The words, the creative art -- just beautiful! I'm glad to see that a new 'victim' will be chosen for next year. It's a great feature for the blogging world. Just had to stop by while on vacation. Had one more 2012 promise to fulfill. Congrat's on a great Alex Hop! The blogfest in your 'honor' was a blast. Great fun. I'll check out Christine Rains' book. Thanks for the tip. That's a lot of thank yous. I love the plywood cutout from Elise! 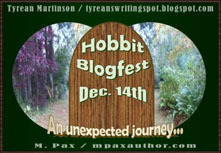 Ah yes, a "Hobbit Blogfest" I am an expert on all things 'Hobbity'. J.R.R. Tolkien spent some considerable time in the town I now live in, Leek, England. The locals were apparently inspiration for some of his characters. I can understand that! Congrats on everything and a roast is fun. Andrew, remind me and I will mention both on Monday! Just got back from The Hobbit - a little long but great. Rachel, annual but with different people. LG, glad you enjoyed it. Elsie, thank you! I'm still not grown up though. Thank you so much, Yolanda. Congratulations to everyone who got their books published and especially, to Ellie, Elise and Jeremy! I'm a bit jealous of Cheers Blogfest winners because I love my Ninja Captain! YES, we should make the Cheers Blogfest an annual thing! I mean it's a way to GIVE BACK positively and with everyone involved. Yep, Koopman is the madman of that wonderful blogfest and I must give him credit! Alex, you should co-host that Cheers blogfest...expect me runnin' to the Linky list before I get outta bed! Absolutely, I'm seeing The Hobbit this weekend - tomorrow, actually. The film is the talk of the town so why not see it? Mixed reviews, 48 frames per second instead of 24, etc. Don't make excuses! I'm not! I cannot wait until I step foot in that theatre to see the EPIC Peter Jackson's The Hobbit! I hope you enjoyed the film Alex! Loved Elise's post .... so CONGRATS to her! Congrats to ALL the winners. It was great joining together to bond even closet through our Ninja Captain! And, yes, this should be a yearly event. There are SOME AMAZING blogger out there that deserve recognition. You've already mentioned to awesome people. *cackles* it so hard not to go through the entire HobbitFest list just going "I know what happens! I know what happens!" Though I see from your comment replies that you've managed to go see it today! Were you happy with the riddle scene? I thought it turned out well. I love Tara's cartoon. Toss up between Mark and Arlee Bird? Tough Ninja call. Elise's ninja caught my eye too. Her Ninja is so cool! So much talent here, I'll have to warp over. I'm honored you found my 'Ninjaman' hilarious. THANKS for being our Ninja, Alex. I may be close to being last again!! Congrats to your winners...that plywood artwork is pretty badass, and that she is sending it to you is even cooler! Def seeing the Hobbit but not til after I get back from Christmas vacation...it's gotta be good! I hope you have a wonderful holiday season and we'll miss you next week on the Apocalypse Blogfest. Ninjas playing guitars - surefire recipe for awesome! P.S. Thanks for the special mention, too. The blogfest was heaps of fun, and I love the idea of seeing it continue next year, with someone else in the spotlight! As for THE HOBBIT, I'll probably see it between Christmas & New Years sometime. Congrats to the winners. Elise and Ellie are super talented: Loved the plywood figure and the video. The blogfest was loads of fun. Next year, count me in. Huge congrats to all the winners! Ellie and Elise are just brilliant and Jeremy's banners were stellar. You know I am down for the next one. You have some stand up headliners in mind. P.S. I am down to roast anyone at anytime. 2013, here we come! Congrats to Elise and everyone else who got a mention! I hope you enjoyed the blogfest, ALex. Livia, thanks! Yes, I do plan on co-hosting next year. Saw the Hobbit Friday afternoon - it's great! Rebekah, yes! Thought it was very well done. And Andy Serkis is amazing. Spacerguy, yours was one of the best. Chuck, your entry was incredible. Sorry I can's participate, but I will plug it for you. T, yours was really touching. The entries were great. I managed to visit all by dinner on Monday thanks to Ninja skills. Trisha, we plan to continue. Melissa, happy birthday and it's a pleasant journey. Loved the trivia and hearing about your blogging origins. I've only been blogging since June 2010 and it's been a blast. Hats off to the winners of the Alex Fest! Great job. Glad to hear this Fest was the first of a series. There are a lot of bloggers who deserve some attention for all their words. Congrats to Ali and Christine on their new releases! And yay for second breakfast! I'm hoping to see The Hobbit next week. The blogfest was a lot of fun :-) Looks like it's set to become another yearly event! Wonderful and commendable work of great solidarity of Ali Cross. Greetings. Lots of news, I'm overwhelmed by it all! LOL Love the wooden Ninja, it's cool. Congrats to Elise and Ellie! I loved Elise's version of you. Lee is definitely a great pick!! Great choices for winners! Hilary Melton-Butcher had pointed those two out for me and they are very deserving! I'm all for a Lee fest! My mind is boggled every time I read one of your posts, Alex. All the news and fun stuff is right here. Now I'm heading off to investigate The Indelibles. Ellie Garratt's video was great. Definitely innovative and deserving of her prize. Full of news as always Alex and I'd choose a second breakfast too. My fall in November proves I should stick to writing about adventures. Love the Indelibles. Congrats to Ali. Congrats to the winners. Can't wait to see the Hobbit! I look forward to read your thoughts about The Hobbit. When everything goes well, my wife and I will see The Hobbit on Monday evening. Tina and Donna, he is so deserving. Edi, my review will be up Monday. Thank you for plugging my blog. I appreciate it so much. It was a very chaotic day the last few days and was unable to comment and show my appreciation. I'm also aware that you are published and probably wouldn't need my critique. If this changes and would like my opinion on something I would love to help. Sorry I didn't join in, but I am a bit of a hoverer on the fringes. Was delighted with everything everyone wrote about you though. Yes, I'm going to see the Hobbit!! Even if I have to wait in line. Unfortunately not seeing The Hobbit this weekend. Sigh. I'm totally ready for a Cheers Blogfest 2013! Your own special blogfest was pretty awesome... loved reading everyone's answers:) Lots of great new books coming out...going to check them out now. Like The Golden Eagle, I am saddened that work prevents me from seeing THE HOBBIT this weekend. Bummer. Great Leave it to Livia post. It's good to hear how someone who started as ignorant as many of us is now doing so well through hard work and making the right connections. I will be looking for the detailed blueprints and step-by-step instructions, pictures when necessary, for your success. Jo, you still posted something nice. Roland, such a senseless tragedy. Nancy, proof anyone can make it! I really love the movie trivia idea Alex! So glad the ninjafest went well, Alex -- you are a much-appreciated member of the blogosphere, and don't you ever forget it! I read The Hobbit every year with my 8th graders, and we always get a big kick out of the riddles scene -- then I have them make up their own and try to stump each other. But nobody has to worry about getting eaten. Love the creativity. :) Very cool, Alex! Congrats to Elise and Ellie. Thanks for all the book news. AlexFest was fantastic. I'll look out for the next Cheers blogfest. Congrats to the winners! I'm sorry I wasn't around to visit everyone, but I had a great trip. Glad you had a blast with the blogfest, Alex. You a heathen? I'd never believe it! Cheers to you and all your friends. Optimistic, I post them a couple times a month. Milo, that's a clever idea! Medeia, one is in the works. That's all right, Ciara - it was a lot of fun. Great picks for the winners. They're so creative. Now I have to scroll back up and visit some links. Oh Lord. It's after midnight on Sunday and I'm just now getting to your Friday blog? I've got so much catching up to do! And I'm so glad your blogfest was a sucess. You deserve the best. I also am quite far behind in reading. Just watched Ellie's video - I see why she won, although Tara's art work was pretty great. The voting is SUPER close, Alex. Good luck! Ah, I'm sad I missed this post at the time. Belated congrats to the winners!! Haven't seen the Hobbit but will you give us your review? I always trust your taste in movies. Okay, I just saw that you did give a review. Haha, yay! Late commenting on this cause the holidays have been keeping me super busy. But, just wanted to say I loved all your choices for winners. Elise and Ellie's entries were both excellent..wow. Lot's of E's there. haha. And the banners were AWESOME! Congrats to all the winners. I think that was one of the best blogfests I've participated in. LOTS of fun!! I think it would be a great idea to make this an annual event! It was a pleasure roasting, err ... honoring you, Alex! Thanks for letting me, and congrats to the winners!